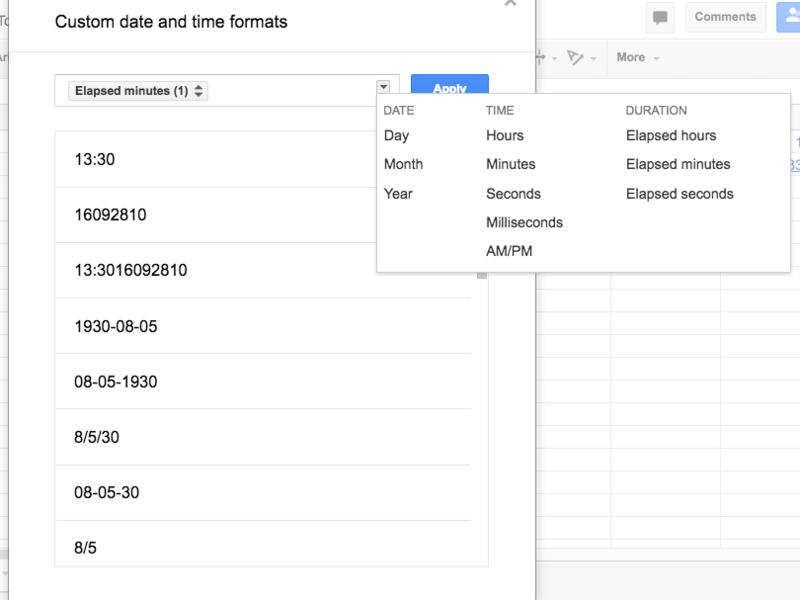 All I'm ultimately trying to do is to get a Duration result in Google Sheets to show up in a "total number of minutes" format vs in its default format of hours:minutes. For example, if the Duration Result is displayed as "3:15" (meaning 3 hours and 15 minutes). I instead want it to be displayed as "195" (3 hrs x 60 minutes equals 180 plus 15, right?). I need it this way because I want to do calculations off that integer! For example, if I want to dedicate 25% of my remaining time this afternoon to a task and I only have 195 minutes left, I want to have a formula that can multiply 25% of that remaining time number (in this example, 195) and return a result of 48.75 minutes. 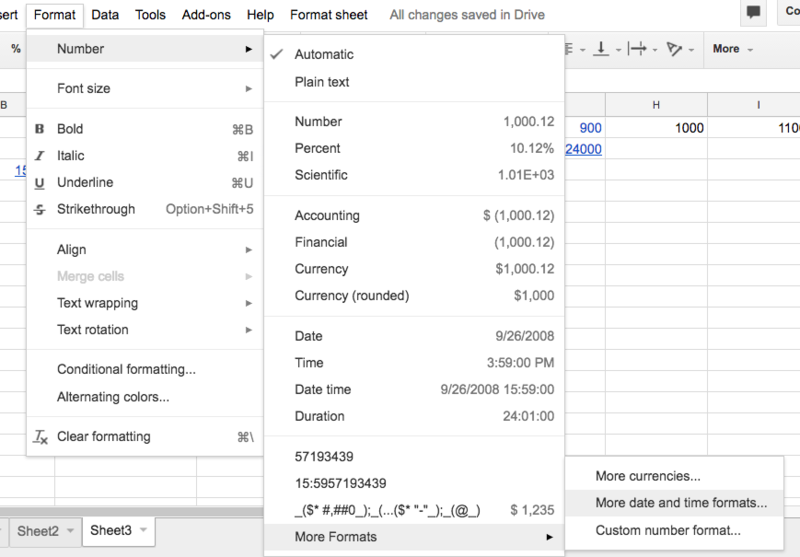 The unit of measure for time representation in Google Spreadsheets is, by default, one day. One thing though: when you make a formula like that, by default it will be also formatted as a time duration, and show 0. As the last step you must then format the cell as a number explicitly. There is indeed a simple fix to your problems. One thing you must understand is the internal representation of date and time in the cell. In the column C you've entered the hour 17:30. It is represented internally as the number 0.73, because it's approximately that fraction of a day. In the column E, however, when you enter =NOW(), the part before the decimal dot is no longer 0 - it's today's date! and that is represented as the number of days since December 30, 1899. Same as in Excel, by the way. This is the reason why you see the huge negative number. Since TODAY() gives the current date without the fractional time, the subtraction of TODAY() from NOW() gives you just the fractional time. The column G will contain the correct number of minutes then. Google spreadsheets: How to get average session per user instead of all users?